Group Facilitation: A Research and Applications Journal is a multi-disciplinary publication focused on the art and science of group facilitation. The aim of Group Facilitation is to advance our knowledge of group facilitation and its implications for individuals, groups, organizations, and communities. It is published annually. The Group Facilitation Journal is intended for facilitators, mediators, organizational development and training specialists, managers, researchers, and others who seek to use facilitation skills in their practice. Articles represent diverse perspectives, including organizational learning and development, group and system dynamics, collaborative technology, negotiation, mediation, leadership, decision-making, conflict resolution, cross-cultural contexts, and education. Possible topics include, but are not limited to, facilitator roles within the group, interventions for conflict management, descriptions of specific facilitation methods, approaches to facilitating specific tasks such as idea generation or priority setting, using computer technology to support facilitation, increasing participation in organizations, exploring the underlying values, beliefs and models of facilitation, and applying facilitation skills and concepts to various settings. The journal is comprised of the following sections: Application and Practice; Theory and Research; Edge Thinking; Book Reviews. 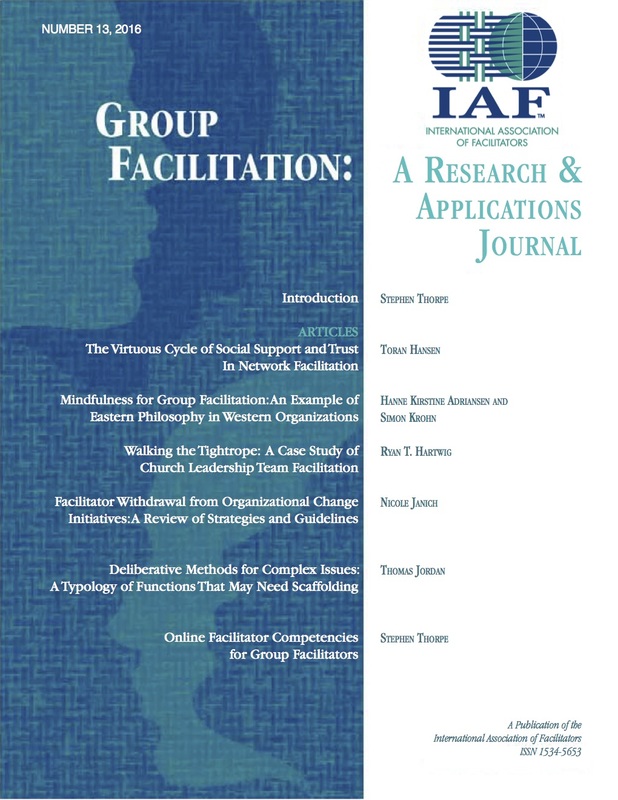 Group Facilitation: A Research and Applications Journal is published annually. Regarding deadlines and due dates, we do not review articles with a particular issue in mind. The review process for the journal is double-blind. That is, the identity of the authors is not known to the reviewers, and the identity of the reviewers is not known to the authors. Articles, essays, and book reviews that have been accepted for publication must be received in final form by November 1 for inclusion in that year's issue.